The original proposal to establish a longer distance walking track in the Dalhousie Springs complex arose during a discussion I had in 2011 with Dean AhChee . Dean was at that stage interesting in an indigenous guided-style walk but no specific features were discussed, except the general idea and merit of such a project. As I am quite familiar with much of the country currently not accessible to visitors, It seemed a responsible move to encourage people who had spent at least two days in their vehicles, to give them the opportunity to have some serious exercise while in the Witjira Park, and in the process to learn a bit more about the ecology of the springs and surrounding wetlands. This project was flagged in the 2012 working bee report which Elizabeth and I co-ordinated, and was to be progressed in 2013, but we were unable to participate that year. 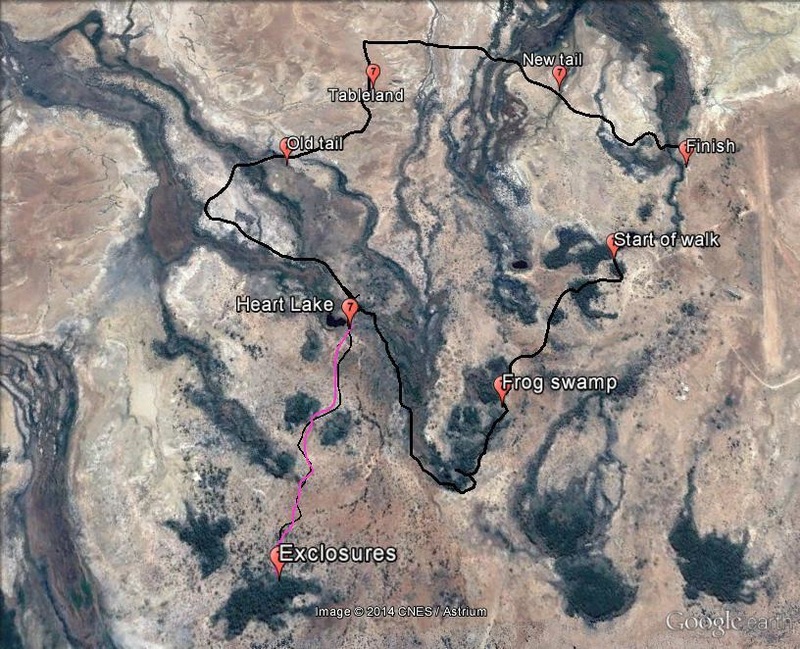 This year the group carried out a full reconnaissance of a proposed route for this walk, albeit in an unofficial way, as there could be some sensitivity as far as some features of interest were concerned from an indigenous perspective. 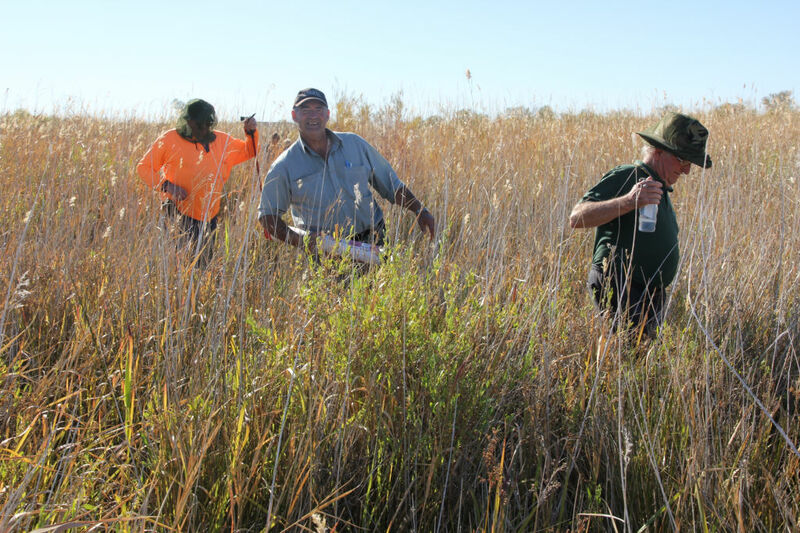 Most members of the working bee took part in determining the best route for at least one sector of the proposed walking trail. The walk proposes to start at Main spring near the pump-house and finishes at the Kingfisher walk about 200m north of the Medicine hill bridge, or, vice-versa. Total length of walk is about 9 km. Some points of interest are marked on the aerial photo, and the full list of 26 are illustrated by the photos included in this presentation. These are not exhaustive and of course alternative routes are possible. An off-shoot of about one kilometre is proposed to take in the historic rabbit exclosures erected in 1981. The proposed walk starts off at the same place as the Medicine Hill walk adjacent to the main pool (spring). Total length of boardwalk needed – approx 72metres with 8 tails crossed and some wet ground adjacent. This is proposed as a FOS exercise, to give members a project of real and lasting value, and as Patron and person experienced in walking trail development, I would be prepared to oversee the work by our volunteers for the duration, in conjunction with DEWNR ranger staff. The main cost items for materials for this walk would be the marker posts (suggested as standard as per walking trails support group – Rob and Sue Marshall), the interpretive signage and pamphlets (if produced) and the material for the eight boardwalks required. In our opinion the work involved could be carried out over, say, a three year period. FOS would provide the labour free of charge and together we have the expertise to do the tasks involved. To fit within other work programmes for FOS and DEWNR on the Park, the project could be completed in the following three stages, (to be incorporated into an amended three year plan). Main Spring to vicinity of Heart Lake (to first tail crossing point) This would include features 1-11 below, and involve construction of at least one boardwalk of about 5 metres. From kingfisher walk 200m north of metal bridge on Medicine Hill walk, to northern end of Tableland (photopoint site). This would include features 21-26 below and would include five boardwalks over active tails and wet ground. Joining up the two above segments, including features 12-20 inclusive and involving three boardwalks over active tails. Marker posts every 200m or interpretive signage throughout could be installed that year as well. See below for a satellite view of the proposed trail.